Isla Canela covers an area of almost 4,500 acres and it lies at the mouth of the River Guadiana, where it enters the Atlantic, on the border between Andalusian Spain and the Portuguese Algarve. The layout – part of an island tourist complex that includes residential property, hotels and a marina – is routed over former marshland that was tranformed into a very relaxing, holiday golf course by Juan Catarineu in 1993 with fairways that are generally wide, framed by a variety of olive, orange, palm and eucalyptus trees. Unusually, the round starts with a par three, followed by one of the hardest holes on the card, a 540-yard par five, where a stream meanders across the fairway to set the tone for the round; on such flat terrain, water is bound to come into play a lot – and it does! The left doglegged 14th is a tough nut to crack (playing as stroke index 1) and it starts a relatively demanding closing stretch, ending with the par five 17th (where water threatens the drive) and the home hole, where out of bounds lies on either side of the fairway. Playing a course in the winter has its limitations because you don’t get to see it at its best, especially if it’s a holiday track like Isla Canella. Still, for people seeking a little sunshine golf around the start of the year, this is the sort of place that should fit the bill. Much of the course is set out on reclaimed land close to where the Rio Guadiana – which separates Spain from Portugal in this corner of the country – spills into the sea so it’s very flat, relying on natural features like streams and wetland areas to add visual interest to the layout. After the opening four holes, holes 5-8 play around a housing development and they’re the least appealing on the front nine, though the 7th is a terrific par five, bending first to the left, then to the right, as the hole follows the meandering path of the Estero de Puerto de Plata on the right hand side of the fairway. Starting at the 10th – where the tee shot has to carry another wetland area before the fairway veers left to a two-tiered green – the action hots up a little as the routing on the inward half heads to the north and onto higher ground. The 13th (pictured) is a rather unique hole, played uphill, past a large white-painted obelisk (used as a navigation aid by mariners) which stands sentinel in the middle of the fairway. And if that’s not enough of an obstruction on this hole, there are a couple of trees planted right in front of the green to further frustrate you! I’m a little surprised by the current rating for Isla Canela when compared to the (albeit very limited number of) Spanish courses that I’ve played elsewhere but good luck to the club if it’s punching a bit above its weight right now. A group of us from Gloucestershire have been going over every December for the last 10 years or so to play for a week on the “Spanish Algarve” and always play Isla Canela at least once. Handicaps 5-20 and we have a love/hate relationship with this course not because it’s a bad course (its actually an excellent golf course) but because it’s a lot tougher than the courses we are used to in England. It's tough because its tight, long,t here are a lot of accessible water hazards and the fringes of the greens are made of that sort of thick clumpy grass which makes it very tricky to chip out of for all but the most skilled players. The greens are almost always in superb condition and very quick (which makes chipping even tougher). Its flat and a fairly easy walk although most take a buggy because its quite hot, even in December. The only negative is that the fairways can to be a bit on the bare side in places. Overall we think it’s a great course and incredibly good value. If there are 100 better courses in Spain, well lucky old Spain ! If you are over at Isla Canela, you ought to go and play Costa Esuri just a couple of miles up the road. It was closed for a time but is now re-opened and it is a much better and more interesting course than the flat and rather boring Isla Canela. 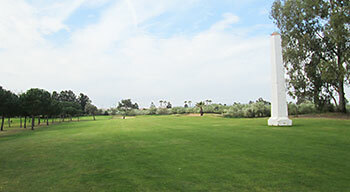 It has some generous fairways but it is long and tough with some glorious views over the Guardiana river.